Outward Bound Singapore (OBS) is extending its youth expedition activities, now conducted mainly on Pulau Ubin, to new areas in Punggol and Pasir Ris, among others. These activities will be incorporated into the Ministry of Education-OBS Secondary 3 programme that started earlier this year. Some 4,300 students have enrolled to get some rugged physical activity and social interaction. It is a five-day outdoor education programme in which students get to meet teenagers from another school and learn to overcome various outdoor challenges. Young people in the programme can now take part in activities such as cycling in park connector networks, as well as paddling in Punggol Reservoir. Currently, most of OBS' activities, including trekking and kayaking, are held on Pulau Ubin. The addition aims to help young people better appreciate nature on the main island of Singapore and embrace a more active lifestyle within their communities. Sec 3 student Kong Zheng Yao from Catholic High School tried kickbiking - a cross between riding a scooter and a bike - on Wednesday in Punggol and Pasir Ris. He enjoyed the scenery, he said, and would want to return in the future. He was one of 24 students from Catholic High and Woodlands Ring Secondary who were taking part together. 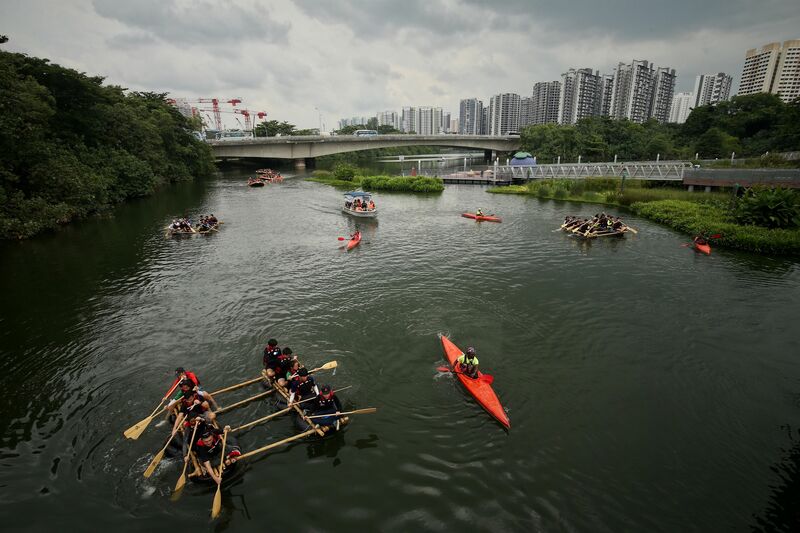 "It's amazing from our experience today how much you can do with the very small area that we have, with mainly very creative use of space," said Ms Grace Fu, Minister for Culture, Community and Youth at a media briefing, after paddling with students and 20 newly appointed members of the 15th National Youth Council in Punggol Reservoir . Mrs Tan Chen Kee, 44, divisional director of student development curriculum at the Ministry of Education, said: "We can also help them (the students) to appreciate the cultural and the natural heritage that they have here (Singapore), so that they don't need to go all the way overseas to appreciate the outdoors." OBS plans to work with relevant agencies to continue to expand its activities across mainland Singapore. A version of this article appeared in the print edition of The Straits Times on August 18, 2017, with the headline 'OBS to extend activities to new areas'.